Beef liver is an amazing product. And although many housewives avoid its preparation, the liver can be an excellent filling for pancakes, pies or act as a complex side dish. The main thing is to know how much beef liver is boiled. We all know that the liver is a very useful product for the body. Its composition is saturated with essential vitamins of group B, C, A and, of course, folic acid. However, not every one of us will risk including this dish in your diet. Why? Yes, you can find a lot of reasons for this. One does not like its smell, while others consider the by-product too harsh, others simply do not see any special need for this. To begin, soak the liver in very cold water for 15 minutes. Then put it in warm water for another 10 minutes. After completing all these steps, use a sharp knife to make several cuts on the film and carefully separate it from the main part of the by-product. Now cut the liver into pieces and check for the presence of large vessels and veins inside. If there are any, remove them carefully too. In addition, the liver has a very distinctive bitter taste, which can be eliminated by ordinary baking soda. It is in it that we roll each piece and leave it to marinate for 1 hour. After this time, thoroughly wash the liver in cool water. After this, the pieces are transferred to an enamel bowl, filled with water and boiled. How much time will be cooked beef liver, largely depends on its size. In our case, this process will take about 25-30 minutes, and if the by-product has to be boiled whole, then about 50-60 minutes. Check the readiness of the liver is quite simple: remove a piece of broth and pierce with a fork. If a brown liquid flows from the incision, then cook more. And in the case when there is a clear juice, the liver will be ready. As you can see, there is no particular difficulty in the process of cooking the liver, but there are small nuances. For example, salting beef entrails is necessary only at the very end of cooking, and even better when you make them stuffing. In addition, no matter how you would like to cook soup on the basis of broth, you should not do this. It is in the water that the greatest concentration of extremely harmful substances and processed products is now collected. We have already found out that beef liver dishes will not please everyone. But it is especially difficult to force to eat this very valuable product of small children. In this case, the mothers resort to some tricks and in every way try to disguise the liver under another dish. In fairness it should be said that many of this trick succeeds. For the children's menu, prepare the liver, as described above. The only exception is the process of soaking it: the by-product must be put in milk for half an hour. Pre-soaked and cleaned liver cut into small pieces. Now turn on the "Quenching" mode on the multicooker. At the bottom of the bowl lay out sliced ​​onions and carrots. The number of vegetables should not be more than 30% of the total mass of the liver. Lay out our pieces of by-product on a vegetable cushion and pour water over it so that it covers all the ingredients for about a centimeter. Then lay out sour cream at the rate of 100 grams of product per 1 kilogram of liver. Close the multicooker lid and simmer the dish for at least half an hour. How much beef liver is cooked for a child in a slow cooker is not easy to answer. Here, much depends on the brand of the machine itself. Our calculations are for the Redmond multicooker, and if you have a different model, first you need to check with the instructions. Another option for cooking beef liver is the microwave. For many, this method will become a real discovery, because we are used to the fact that a microwave oven only heats, fries and bakes on the grill. The remaining functions of this amazing kitchen appliance are forgotten or remain unexplored. In fact, cooking in the microwave is a pleasure, there are many advantages - speed, simplicity and a special taste of dishes. First of all we prepare a by-product. Then cut the liver into pieces of such a size that they easily fit in a glass dish. We take the onion head, clean and cut into half rings. 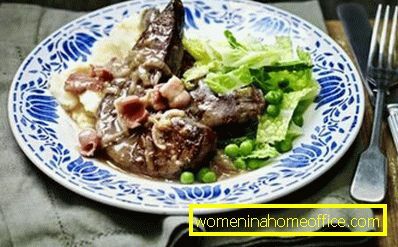 Put the liver in a glass dish for a microwave, add salt and pepper, add chopped onion, a slice of margarine and 2 spoons of sour cream to it. Fill all with a small amount of water and cover with a second transparent plate. Turn on the microwave at full capacity and cook the liver for 7 to 10 minutes depending on the model of the device. Now you know how to properly and tasty boil beef liver. You can do this with the help of an ordinary pot of water or entrust the preparation of a by-product to modern kitchen appliances - a microwave and a slow cooker. The main thing is that the result will delight you and your loved ones.